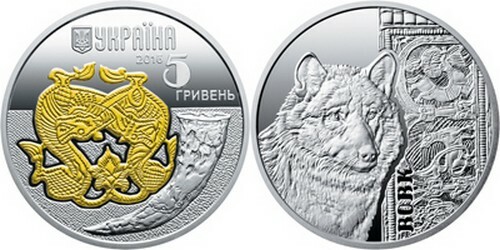 UKRAINE 3 x 5 Hryvnia 2016 – Loup, cerf et Paon – 3 x 15,55 g Argent 925 spécial UNC (partiellement plaqué or) – 4000 exemplaires – diamètre 33 mm – prix ignoré. 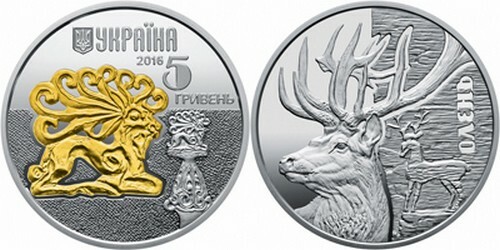 UKRAINE 3 x 5 Hyrvnia 2016 – Wolf, Deer and Peacock – 3 x 15.55 g 0.925 silver special UNC (partially gold plated) – mintage 4,000 – diameter 33 mm – unknown price. NIUE 1 Dollar 2016 – Vierge noire – 17,5 g Argent 999 Proof – 566 exemplaires – taille 30 x 47 mm – prix ignoré. 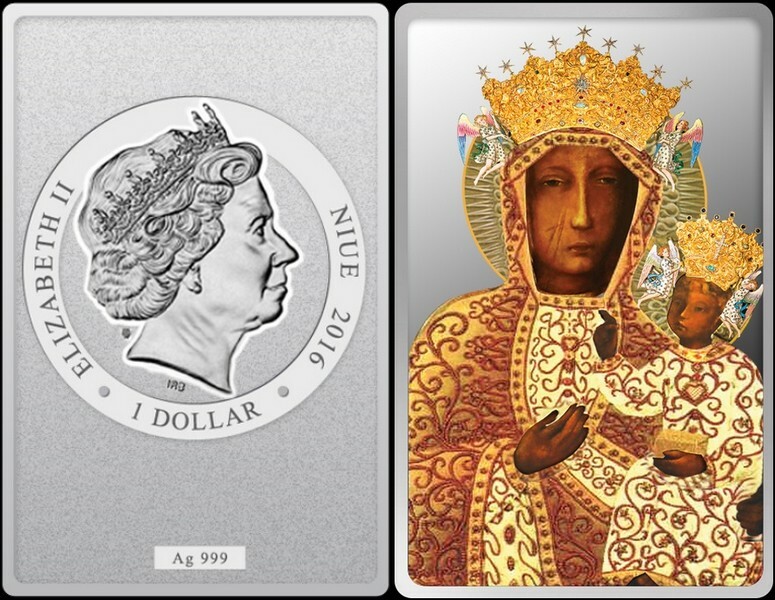 NIUE 1 Dollar 2016 – Black Virgin – 17.5 g 0.999 silver Proof – mintage 566 pcs – size 30 x 47 mm – unknown price. CAMEROUN 2500 Francs CFA 2016 – Poker – 10 de Trèfle – 17,5 g Argent 999 Proof – 300 exemplaires seulement – taille 30 x 47 mm – prix ignoré. 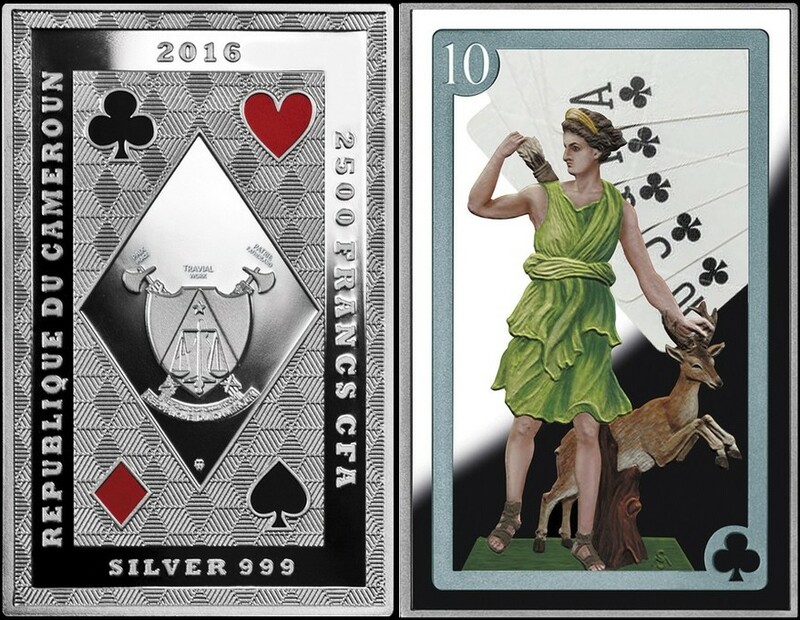 CAMEROON 2500 Francs CFA 2016 – Poker – 10 of Clubs – 17.5 g 0.999 silver Proof – mintage 300 pcs only – size 30 x 47 mm – unknown price. CAMEROUN 2500 Francs CFA 2016 – Jasna Gora – 17,5 g Argent 999 Proof – 966 exemplaires – diamètre 38,61 mm – prix ignoré. 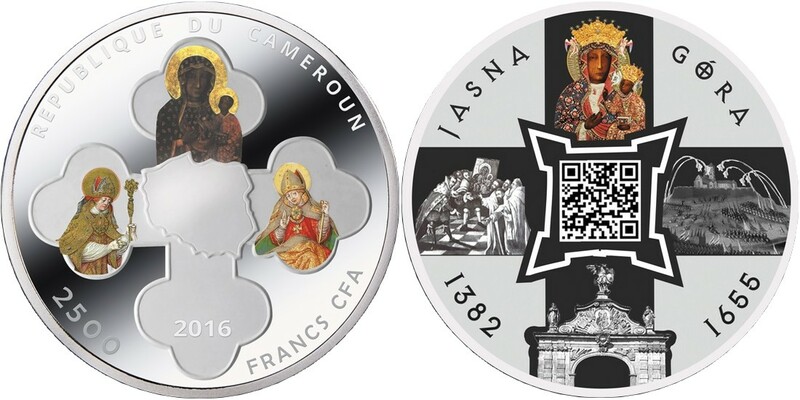 CAMEROON 2500 Francs CFA 2016 – Jasna Gora – 17.5 g 0.999 silver Proof – mintage 966 pcs – diameter 38.61 mm – unknown price. CAMEROUN 2500 Francs CFA 2016 – Collegium Hosianum – 17,5 g Argent 999 Proof – 966 exemplaires – diamètre 38,61 mm – prix ignoré. 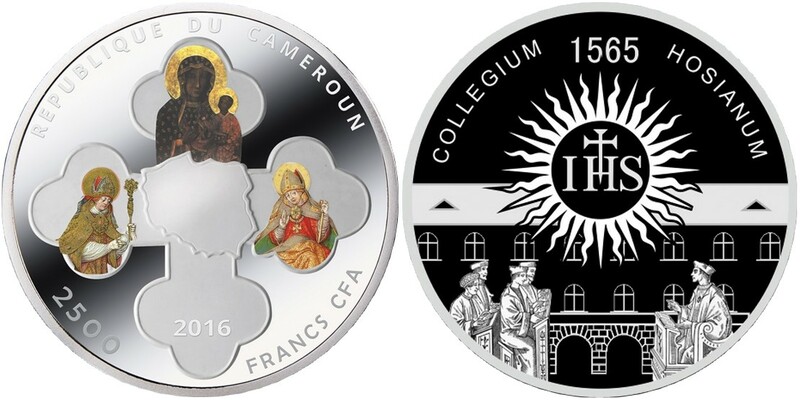 CAMEROON 2500 Francs CFA 2016 – Collegium Hosianum – 17.5 g 0.999 silver Proof – mintage 966 pcs – diameter 38.61 mm – unknown price. CAMEROUN 2500 Francs CFA 2016 – Anno Domini – 17,5 g Argent 999 Proof – 966 exemplaires – diamètre 38,61 mm – prix ignoré. 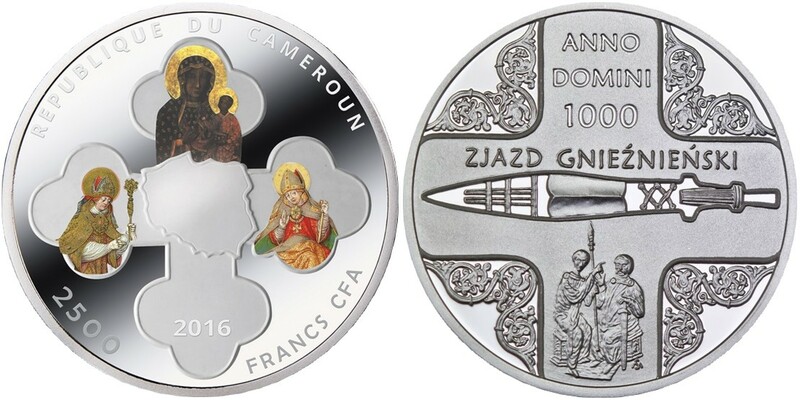 CAMEROON 2500 Francs CFA 2016 – Anno Domini – 17.5 g 0.999 silver Proof – mintage 966 pcs – diameter 38.61 mm – unknown price. CAMEROUN 500 Francs CFA 2017 – Giovanni Bonati – 17,5 g Argent 999 Proof – 555 exemplaires – taille 40 x 40 mm – prix ignoré. CAMEROON 500 Francs CFA 2017 – Giovanni Bonati – 17.5 g 0.999 silver Proof – mintage 555 pcs – size 40 x 40 mm – unknown price. 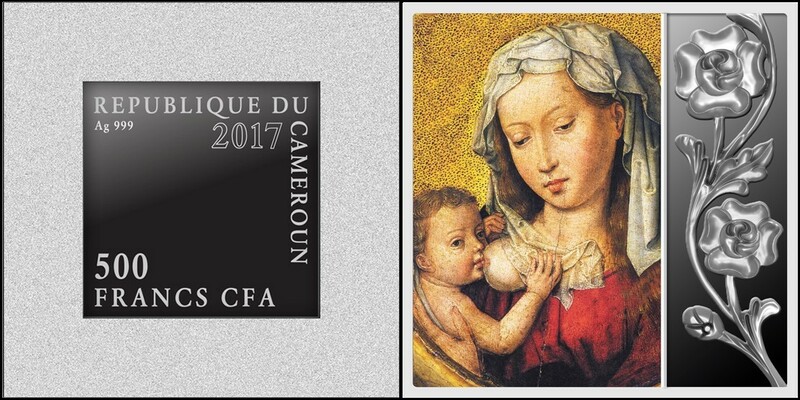 CAMEROUN 500 Francs CFA 2017 – Hans Memling – 17,5 g Argent 999 Proof – 555 exemplaires – taille 40 x 40 mm – prix ignoré. 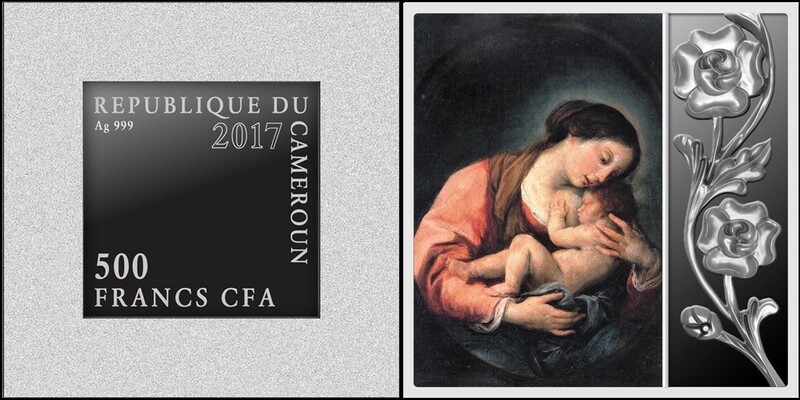 CAMEROON 500 Francs CFA 2017 – Hans Memling – 17.5 g 0.999 silver Proof – mintage 555 pcs – size 40 x 40 mm – unknown price. CAMEROUN 500 Francs CFA 2017 – Joyeux Noël et bonne année – 16,5 g Argent 999 Proof – 999 exemplaires – diamètre 38,61 mm – prix ignoré. 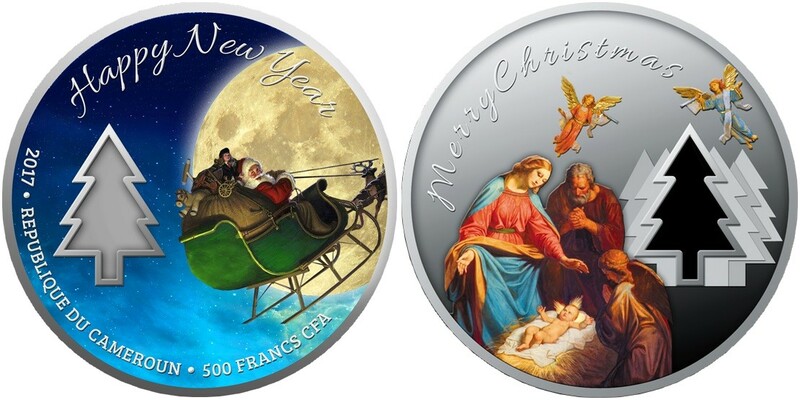 CAMEROON 500 Francs CFA 2017 – Merry Christmas & Happy New Year – 16.5 g 0.999 silver Proof – mintage 999 pcs – diameter 38.61 mm – unknown price. NIUE 2 Dollars 2016 – Paul Cézanne – Joueurs de cartes – 62,2 g Argent 999 Proof – 600 exemplaires – taille 57 x 57 mm – prix ignoré. NIUE 2 Dollars 2016 – Paul Cezanne – Card Players – 62.2 g 0.999 silver Proof – mintage 600 pcs – size 57 x 57 mm – unknown price. NIUE 1 Dollar 2016 – Nouveau né – 16,81 g Argent 999 Proof – 999 exemplaires – diamètre 41 mm – prix ignoré. NIUE 1 Dollar 2016 – New Born – 16.81 g 0.999 silver Proof – mintage 999 pcs – diameter 41 mm – unknown price. NIUE 1 Dollar 2017 – Scarabée – 17,5 g Argent 999 Proof (partiellement plaqué or avec insert de turquoise) – 999 exemplaires – diamètre 38,61 mm – prix ignoré. 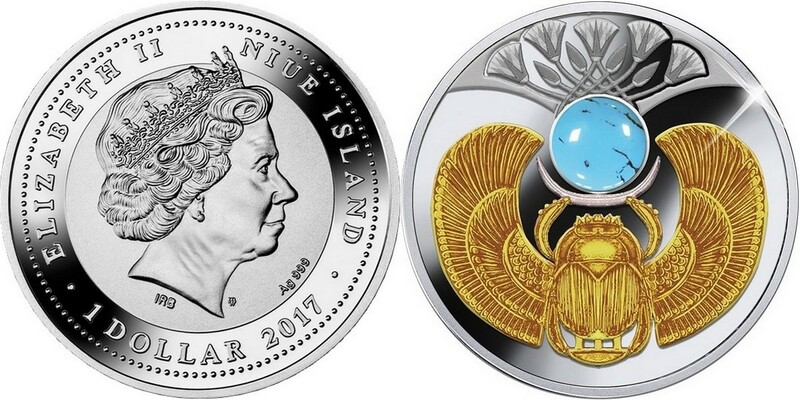 NIUE 1 Dollar 2017 – Scarab – 17.5 g 0.999 silver Proof (partially gold plated with turquoise inserted) – mintage 999 pcs – diameter 38.61 mm – unknown price. 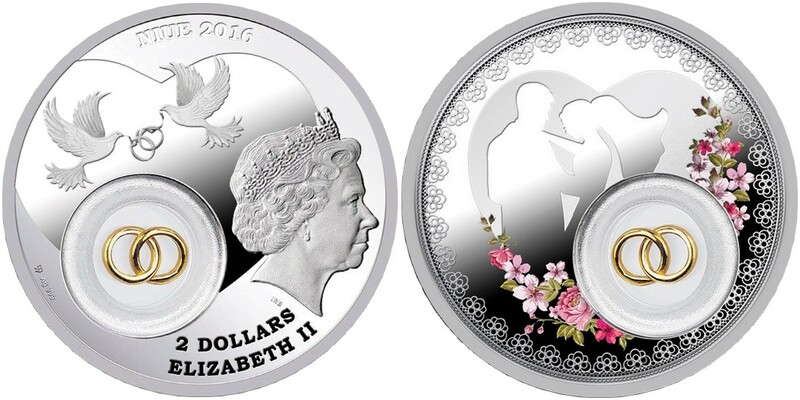 NIUE 2 Dollars 2016 – Mariage – 28,28 g Argent 999 Proof – 6000 exemplaires – diamètre 41 mm – prix ignoré. NIUE 2 Dollars 2016 – Wedding – 28.28 g 0.999 silver Proof – mintage 6,000 – diameter 41 mm – unknown price. 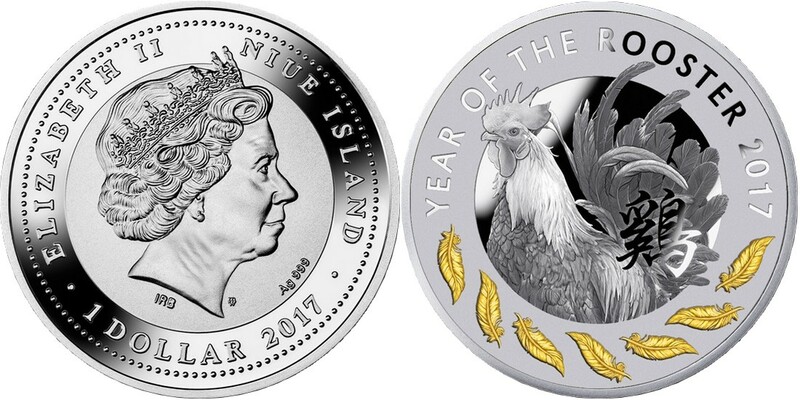 NIUE 1 Dollar 2017 – Année du Coq – 17,5 g Argent 999 Proof (plumes plaqué or) – 1500 exemplaires – diamètre 38,61 mm – prix ignoré. 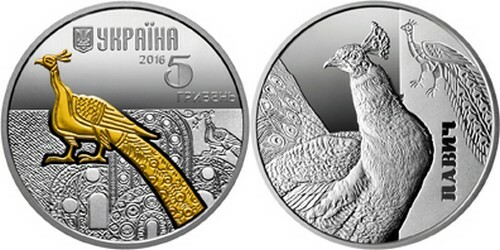 NIUE 1 Dollar 2017 – Year of the Rooster – 17.5 g 0.999 silver Proof (Gold plated feathers) – mintage 1,500 – diameter 38.61 mm – unknown price. NIUE 2 Dollars 2017 – Année du Coq (poule et œufs) – 28,28 g Argent 999 Proof (oeufs plaqué or) – 2000 exemplaires – diamètre 41 mm – prix ignoré. 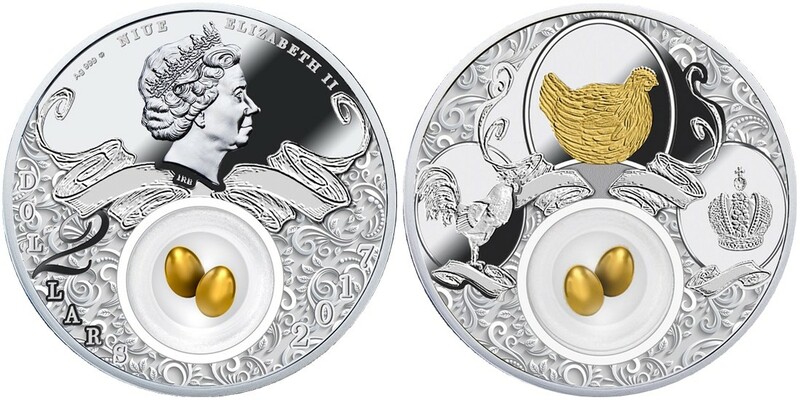 NIUE 2 Dollars 2017 – Year of the Rooster (chicken and eggs)– 28.28 g 0.999 silver Proof (Gold plated eggs) – mintage 2,000 – diameter 41 mm – unknown price. 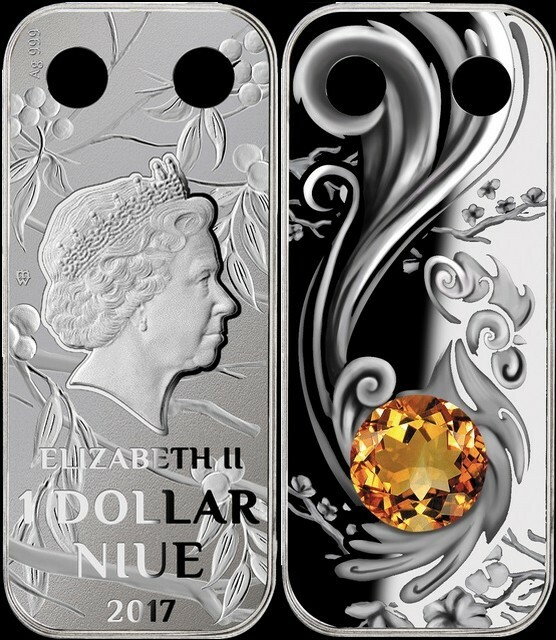 NIUE 1 Dollar 2017 – Année du Coq (pendentif) – 10 g Argent 999 Proof (avec un cristal Swarovski) – 1000 exemplaires – taille 13 x 30 mm – prix ignoré. NIUE 1 Dollar 2017 – Year of the Rooster (pendant) – 10 g 0.999 silver Proof (with one Swarovski crystal) – mintage 1,000 – size 13 x 30 mm – unknown price. NIUE 1 Dollar 2016 – Cheval Frison – 17,5 g Argent 999 Proof – 750 exemplaires – diamètre 38,61 mm – prix ignoré. 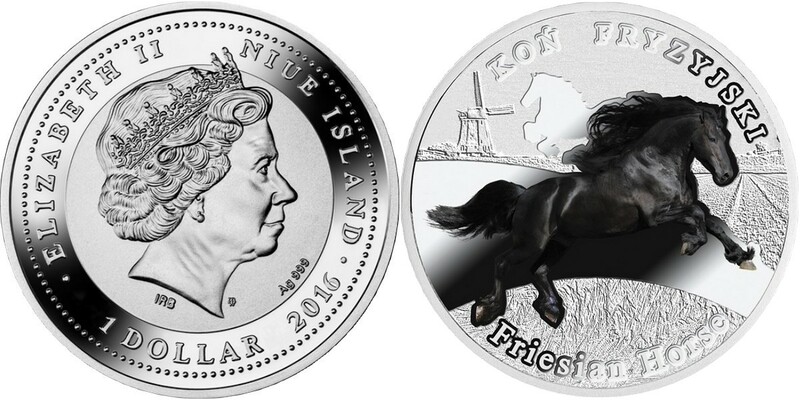 NIUE 1 Dollar 2016 – Friesian Horse – 17.5 g 0.999 silver Proof – mintage 750 pcs – diameter 38.61 mm – unknown price.